This is a story about a little female african penguin who found her own world too small and she felt in love with a big, handsome human man. It plays in the Zoo of Münster (Germany) and it really happened. My story is based on an article that was published in Zoomagazin/NRW (6th Year, NR 2/2000). The author Ilona Zühlke, and also the mentioned penguin attendant gave their permission to freely translate and add it to my site. The pictures are made by me. I could see this love story with my own eyes, and I could also experience how it feels to caress and be "caressed" by a penguin. Sandy hatched in 1996 in Nürnberg (Germany) and raised by her own parents. After a year she came to the Allwetterzoo in Münster. When she was two years old, it appeared how curious she is and she developed a special love for humans. During the penguin walk through the zoo, arranged for fitness reasons, one penguin gets regular out of step. She shows more interest in shoelaces on a children's shoe, than in the fish bucket of the attendant. She is the only penguin, among the 36, who got a name. Her attendant Peter Vollbracht named her Sandy, because he's the man she developped so much love for. 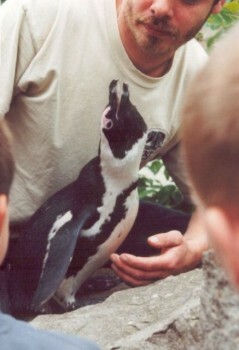 Sandy showed no interest in male penguins. But if she got the chance, she followed Peter everywhere, if it would be possible. Penguins are mostly monogamous and loyal to each other for the rest of their lives, so you could suggest her and Peter to be a couple. In that way, she brought a lot of joy to many children and adults : feeling the soft, relative dry penguin feathers or having a very close look at a penguin. Especially for children with a handicap is it very valuable and Peter putted her several times on the lap of a child in a wheelchair, and visited special schools. She even knows kindergarten schools and a library from the inside. She stood on the podium of the city theatre, when an act was showed for children, with a penguin as mascot. And during a talk show, she got all the attention, as a journalist later suggested. Critical readers will now ask if you can do something like that to an animal. Here the zoo says unconditional YES. Although they "use& the love from Sandy for her attendant, she also has the opportunity to follow her exploring drift and curiosity. At each moment she can move freely and explore the surroundings, and during a "caress hour" there is always just one child at a time who can touch her. In the zoo they consider her as an "ambassador" for all the animals and that can only be positive. However Sandy isn't tamed, but developed herself this predilection for our world, which was manifested mostly during the walks. The more she walked through the zoo, the more she went to a child to play or to take a closer look at a buggy. And slowly they couldn't ignore her predilection for her attendant Peter Vollbracht anymore. In our context you can suggest Peter and her to be "a pair". Addition in 2008: Apparently Sandy has found a new love, after 11 years of love for a human man. 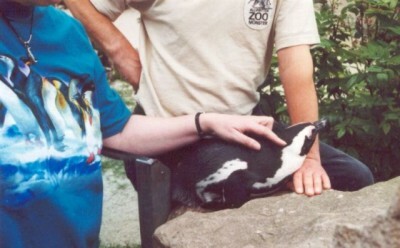 When Peter Vollbracht was ill last year(2007) and couldn't work for some months, Sandy fell in love with a penguin man. The penguin stays nearby her and they made a nest together, in which Sandy laid 2 eggs. After a few weeks breeding they turned out to be unfertilized, so the attendant took them away. Pity, but in August a new breeding season started and this time it was a lucky one for Sandy and her new man too. And although her love to Peter changed to friendship, he still can take her on his arm and she still allows visitors to caress her. "Zoogeflüster - Komm mir nicht ins Gehege!" or also "Pinguin über Bord": German Sat1-film from September 2008 with Sandy as Pinguin Schulze, being a main star of the film. More pictures can be found in the Photogalery.